Rare is the native English speaker who reads and writes Arabic, classical or otherwise. And thus a vast body of literary work lies inaccessible to those who desire to increase their understanding and appreciation of the Arabic-speaking world. Because there is this hole in the material available to scholars and others, the scholarship of much of Europe’s past likely could be construed as being incomplete or even erroneous. That’s why it’s necessary to herald the appearance of works like An Imam in Paris: Al-Tahtawi’s Visit to France (1826–1831) by Rifa’a Rafi’ al-Tahtawi, translated and introduced by professor Daniel L. Newman of the University of Durham. Mr. Al-Tahtawi’s journal, which he kept at the behest of his teacher Hassan al-Attar, is one of the few early and comprehensive accounts of European society written by an Arab. Shortly after its publication in Arabic, a Turkish translation appeared and became a bestseller throughout the Ottoman Empire. Chosen by Mamlūk ruler, Muhammed’ Ali, the former Albanian mercenary who rebuffed French efforts to colonize Egypt, the young Islamic scholar al-Tahtawi joined a group of students sent to France to study modern sciences and French military techniques and tactics. Most of the students called themselves Muslims, although four professed the Christian faith. They sailed on a French ship, La Truite, and landed in Marseilles May 15, 1826. None of them could speak a word of French. And so, at the age of 24, Mr. al-Tahtawi found himself in the France of the Enlightenment, where inherited belief gave way to a system of questioning, observation, and investigation. In other words, a place where the divine right of kings and rulers of every stripe no longer held their subjects down with the grip of an iron fist. Mr. al-Tahtawi soon learned French well and translated works like François de Salignac de la Mothe-Fénelon’s Les Aventures de Télémaque, the first Greek myth to be translated into Arabic. The significance of this work is due to the fact that it basically served as a “guide for good,” one of the “Mirrors for Princes” so popular at the time, meant to educated future kings, in this case the grandson of Louis XIV. But also of interest to the ruler Muhammed Ali, Mr. al-Tahtawi’s patron. Mr. al-Tahtawi’s on-the-spot, you-are-there observations of Paris, “the bride among all regions,” revealed his grudging admiration for the French and their way of life. He describes everything, from libraries to women to clothing to constitutional government. Of the latter, he wrote a great deal and influenced Egyptian thought deeply on the subject. Of particular interest was his description of newspapers and their significance. According to Eugene Rogan, director of the Middle East Center at Oxford University, there were no newspapers in the Arab world at the time. ”Despite their expertise with regard to food and pastry, etc., their food lacks flavour and, with the exception of peaches, the fruit in this city has no real sweetness.” Contrast this with Paris’s impact on the Americans, Benjamin Franklin, and Thomas Jefferson, not too long before Mr. al-Tahtawi’s stay in the city. 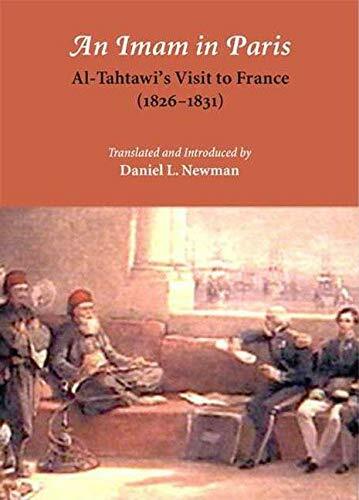 For readers interested in early encounters between European and Arabic culture, An Imam in Paris: Al-Tahtawi’s Visit to France (1826–1831) provides a fascinating glimpse into the life and thoughts of one man who recorded Parisian life around the time that Orientalism firmly captured the imagination of Europeans. Cynthia D. Bertelsen is a freelance food writer and culinary historian with 15 years of overseas experience. She took courses at Le Cordon Bleu in Paris. A member of the National Book Critics Circle, she has published numerous articles, contributions to anthologies and book reviews, and is author of the forthcoming book, Mushroom: A Global History. She is particularly noted for her expertise in French, sub-Saharan African, and North African cuisines, and is the winner of IACP’s Culinary Trust Julia Child Fund grant for 2011.